This renowned Anguilla resort was voted the best resort in the entire Caribbean, including Bermuda and The Bahamas, by the subscribers to Travel & Leisure magazine. Every villa has this view! Some are directly on the sand. And some of those come with their own pools! But if you want your own pool, pull out your wallet! It will cost you $5400.00 per night (in winter). Regular rates can drop to as low as $325 during the summer. 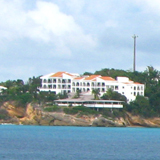 Many Anguilla resorts do discount prices (quietly). So check with your travel agent (online or off) for the best deal you can get. 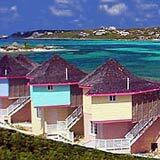 If these prices seem a bit steep to you, click here to see less expensive Anguilla hotels. 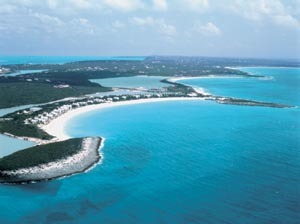 We enjoy going to Cap Juluca for a lunch or dinner. The restaurants are fabulous! But it can't beat out the Malliouhana for our sunset drinks -- that really is magical. Where do we stay? Neither! We rent villas, the best bargain on the island. They're great for having more space, but it's tough to find one on a sandy beach! Luckily, my Dad's friend happens to own one right on Barnes Bay. Click here to see. And we love staying in this villa, too, which is right on the ocean and just a few seconds from its own tiny perfect beach. 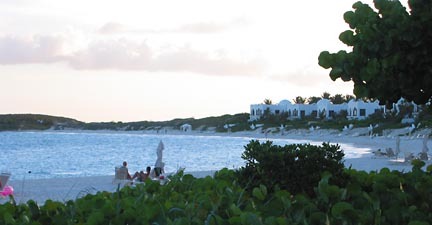 So, while Malliouhana owns our "best magical moment," and while we prefer to stay in villas, you can't argue with Cap Juluca being voted as "the best Anguilla/Caribbean resort"! With great, service, hospitality, restaurants, views, beach, cottages and passion... they've earned it. 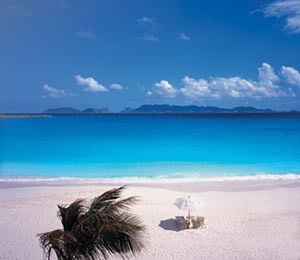 See snow at Cap Juluca!